The elements are called nodes. Each node can have at most two children. The top element is called root-node or just root. A binary search tree (BST) is one that has elements in its left subtree less than itself; and elements in its right subtree is higher than it. If you remember quick sort earlier, any node in a BST is basically a pivot. Expected height of a randomly build binary search tree with n elemements is lg(n) where lg is log2. Most operations in a BST is simple and recursive. I will list the algorithms here. //min is left most node, right? Think about it. So, these were the easier ones. With a little effort one can understand these. I will now discuss, some of the harder ones. Successor and Predecessor: A successor of a node is a node which comes the next if we sort the tree in increasing order. A predecessor of a node is the node that comes immediately before it, if we sort the tree in increasing order. That is it. In a tree containing values 1 3 5 6 7 9, the successor and predecessor of 5 are 6 and 3, respectively. The right subtree of the node will contain the values larger than the node. (right?) If we find the lowest node in right subtree we will have the immediate larger node, and we get our successor. What if the node does not have a right subtree? We will have to go up in the tree somewhere. See the image below. If the node is left child, the parent will the immediate next. If the node is right child, we need to keep moving up until we get a node whose left child is one of the node's parents. Once you get the idea behind the successor, predecessor is easy. Predecessor is highest in left subtree. If the node is right-child, immediate parent is the predecessor. If the node is left child move up till you get a node whose right child is one of the node's parents. If the node had no child, well just knock it off. If it has one child, yank the node and connect the child to the node's parent. If it has two children, then we need to get a replacement for this node. What would be a good replacement? A good replacement is the one that on replacement, maintains the BST property. (At this moment I want you to pause, and think if you have to replace this node who could be the best candidate?) You can choose either the successor or the predecessor. The common practice is too use successor (further discussion assumes we replaced with successor). And then delete the successor from the subtree. 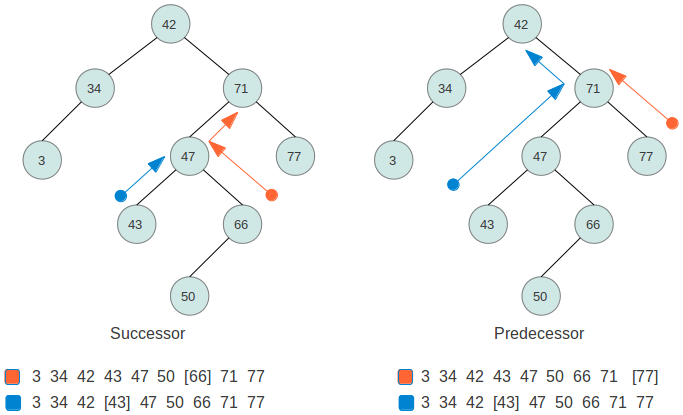 Now, if you read successor code properly, you will observe that if the successor chosen from right subtree, the successor will have at most one child. So, it is NOT going to be a recursive as in "delete a node with two children, then delete the successor with two children, and so on". NO. Just place the successor's value in node. Then clip the successor using either step 1 or step 2. The basic idea is to have elements less than the parent on one side and greater than the parent, on the other. And, whatever criteria you choose, it must apply to all the nodes. The most common is to have smaller in left, but if your rebel inner self does not want to conform to the standard go ahead, make a tree with higher in left. View/download Java code from GitHub, You can see sample output here.